HOUSTON — U.S. Rep. Michael T. McCaul (R-Texas) was officially inducted into Civil Air Patrol’s Congressional Squadron as a lieutenant colonel after his return Oct. 8 from a Texas Wing aerial tour of the Texas-Mexico border and Hurricane Ike recovery efforts on Galveston Island. McCaul’s framed CAP membership certificate was presented by Lt. Col. Theresa Alexander of the Texas Wing’s Delta Composite Squadron. The ceremony, originally planned for August but delayed by Tropical Storm Gustav and Hurricane Ike, was held on the ramp outside the Delta Composite Squadron’s Hooks Airport headquarters building in Spring. During the appearance, the congressman met with local media, renewing his call for increased funding and resources for border security. He also noted CAP’s extraordinary response to the Hurricane Ike damage assessment mission. “The efforts of the Civil Air Patrol in the wake of Hurricane Ike were unparalleled,” McCaul said. He also met with some of the Delta squadron’s cadets, stressing the importance of their activities in the development of America’s next generation of leaders. The Congressional Squadron was formed in 1967 to allow members of Congress and other key individuals in the Washington, D.C. area to participate in CAP programs. The squadron is an operational search and rescue and disaster relief unit, consisting of members of Congress, their staff, legislative and executive branch officials, and aviation professionals. The squadron, commanded by Sen. Tom Harkin (D-Iowa), reports directly to CAP National Headquarters at Maxwell Air Force Base, Ala., and has provided national-level assistance and congressional influence to CAP in a wide range of issues and concerns. On September 15, 2013 Rep McCaul, who is the chairman of the House Homeland Security Comittee, told FoxNews Sunday he would trust Russia to account for Syria’s chemical weapons stockpile. 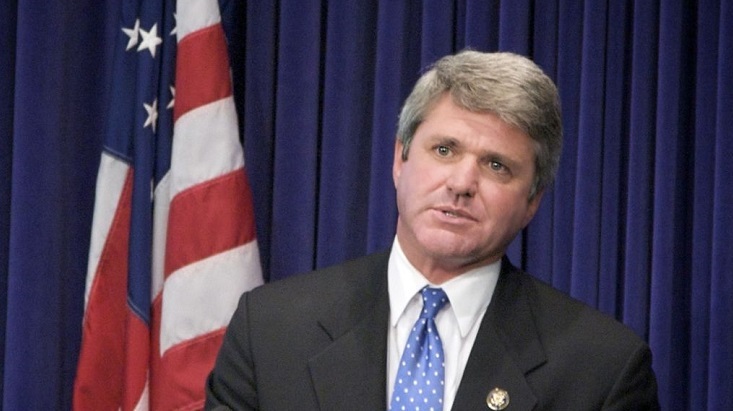 In August 2011 AlterNet reported that McCaul, along with John Culberson and Ted Poe, was attempting to remove the right of deceased soldiers families to choose which prayers, if any, were to be read at a soldier’s funeral. The accusation was that the three were attempting to impose Christian ceremonies on all military funerals, regardless of whether or not the deceased was Christian and with or without the consent of the family of the deceased. They stated that their demands were a response to Veterans Affairs (VA) banning Christian prayers at military funerals. Bu the VA denied this claim is “blatantly false” as VA respects families’ “rights to pray however they choose at our national cemeteries”. Be the first to comment on "Civil Air Patrol inducts Michael T. McCaul into Congressional Squadron"